Fast on the heels of our discussion late last month with esteemed cave-art expert and paleoanthropologist Genevieve von Petzinger, we check back in on this fascinating subject, based on ground-breaking revelations. Just published yesterday, new research on cave art in Spain identifies what is now understood to be the world’s oldest cave painting, pictured here. Previous record-holding specimens were thought to date from about 40,000 years before present. A relatively new process (uranium-thorium dating) suggests this red-pigmented design was created at least 65,000 years ago. What’s particularly notable about that timeline is that modern humans (Homo sapiens sapiens) are believed to have arrived in Europe only 40,000 to 50,000 years ago. So if the dating is correct, then the earliest cave art was created by some species other than humans. 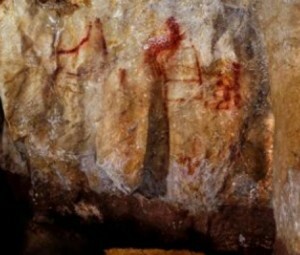 The primary candidate is H. neanderthalensis, or the Neanderthal, which was dominant in Europe prior to human arrival, and whose use of art and abstract expression in other contexts has been well documented. It’s important to note, though, that researchers are at present relying mainly on U-Th dating to connect these sites with Neanderthals. More study, and recovery of more in situ artifacts are needed for confirmation. Not at all surprisingly, Genevieve relays all of this much better than I ever could, on her brand-spanking-new Vlog—so go check it out. This entry was posted in New Post and tagged Art history, cave art, cultural history, Genevieve von Petzinger. Bookmark the permalink.